It’s not always easy finding the sweet spot for your freelance business. I get into conversations with a lot of freelancers, many of them just starting out. And one thing I notice again and again is that freshly-minted freelancers often struggle to articulate exactly what their specialty should be. Which industry niche, if any? Financial, health, industrial, travel, other? What kind of writing specialty, if any… sales copy, email, content marketing, social media writing? It’s important to have answers to these questions. Without answers, you’ll often feel you have no real foundation. It becomes hard to articulate your position and your value to prospective clients. In other words, if you aren’t completely clear about where you stand, and what you stand for as a freelancer, you going to have a lot more trouble marketing yourself and finding good work. I try to address this issue in my course, Marketing Confidence. In fact, I come at it from a few different directions. But even among those freelancers who have taken the course, some still struggle to paint a clear picture of where they stand and what they want to do. So… here’s one more way to try finding an answer. Grab a pad of lined paper. Or, if you must, open a new file on your computer. Now you’re going to write a list of things. I’ll give you some examples in a moment. 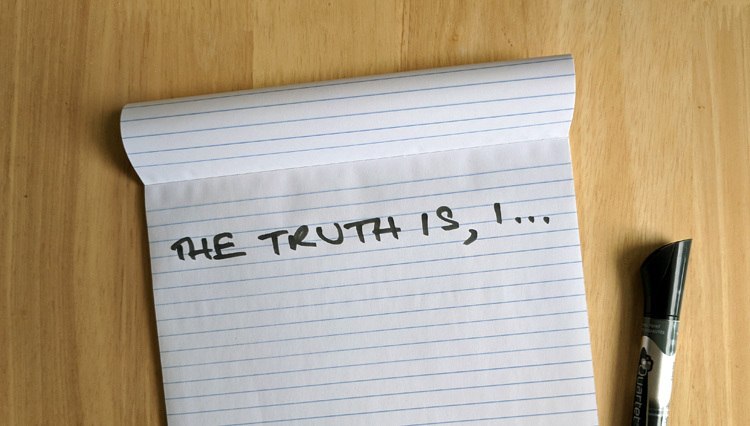 But the key here is to be true to the statement, “The truth is, I…”. Forget everything you’ve learned about freelancing. Forget everything you have been taught in classes or courses, including my own. Forget the advice you picked up from the guru-of-the-month. Instead, be totally and scarily honest with yourself. The truth is, I hate writing sales copy. Gives me the creeps. The truth is, I wouldn’t like to work in the financial industry, even if it is profitable. The truth is, I’m just not comfortable with the idea of putting a photo of myself on my homepage, even if people tell me it’s a good idea. The truth is, I really want to work with local companies. I’d like to get out there and work with people face to face. Your list could be the exact opposite of the one above. Maybe you love writing sales copy and the financial industry, and so on. Doesn’t matter what your list includes or says. This is for you, and nobody else’s opinion matters. This exercise will work only if you are absolutely honest with yourself. What’s so special about this approach? When you’re truthful about what you want, it’s enormously empowering. It’s also a huge relief to shrug off the weight of what others tell you to do. When your work is aligned with what you feel to be true, everything becomes a little clearer. A little easier. Give this a try, as an exercise, and let me know if it helps. 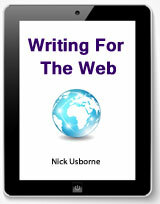 Writing For The Web #1 — 7 Challenges every Writer and Copywriter faces when writing for the Web. Sign up and I’ll send you the link for the download, and then you’ll receive my most recent post as part of my e-newsletter every Tuesday morning. Good news for freelancers: The gig economy is evolving in your favor. 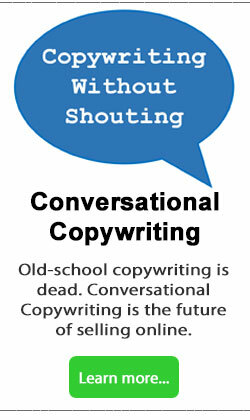 How to get into Conversational Copywriting, without faking it. Thanks for a most helpful post Nick. This technique will come in handy as I try to “tweak” my niche and craft my website message! Thanks, Nick. This flows right into what I’ve been processing in my own mind as I start my writing career (again). I find myself having to turn down the noise and clear the clutter as I chart my course as a writer. I know that I feel a freedom writing in a manner that is consistent with who I am. It gives energy and purpose to start writing again the next day. Hello, Nick. I’ve now read your article twice and will be re-reading it again and again. The first time I did your exercise, a fair number of my bullets were more esoteric than concrete. I am now going to do the exercise again trying to be more concrete with my bullets. Thank you so much for acknowledging the difficulties we newbies can have with our message and the importance of working through it. This is very useful. We often know the answers deep inside, but we don’t give ourselves permission to write it down and make it concrete. This exercise gave my mind the permission to say no to a few things I *should* do, but don’t really want to, such as writing blog posts for businesses other than my own. As a result, my business is more focused. Andrew, hi. Thanks for the feedback… and I’m glad you found the post useful. Learning to say no to stuff is definitely important. 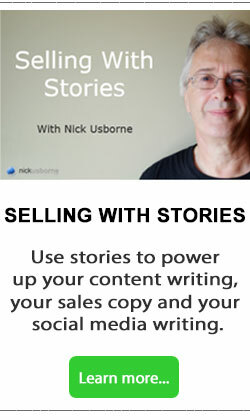 Hi Nick – I purchased your Marketing Confidence course from AWAI as I transition my existing writing career to direct response. One of the most helpful tips you gave for positioning (imho) was to find something that bugs us about the niche we’re targeting… and build our positioning around that. Maybe there’s an article idea in there somewhere for you. But in any case, I wanted to let you know that your insights were just what I needed right now, so thank you. I’ve just done this exercise, and it is really helpful. Thanks, Nick. Thank you for this very informational tips and advice!